We’ve been following Chair’s Infinity Blade [$5.99] like a hawk since we first caught wind of the game at the Apple Keynote. Through various interviews, trailers, screenshots, and other snippets of information, the hype surrounding Infinity Blade’s release couldn’t possibly be more intense. For what it is, it’s an absolutely fantastic gesture-based fighting game that has without a doubt the best graphics we’ve seen so far on an iOS device. However, for all that it is, there are also many things that it’s not. 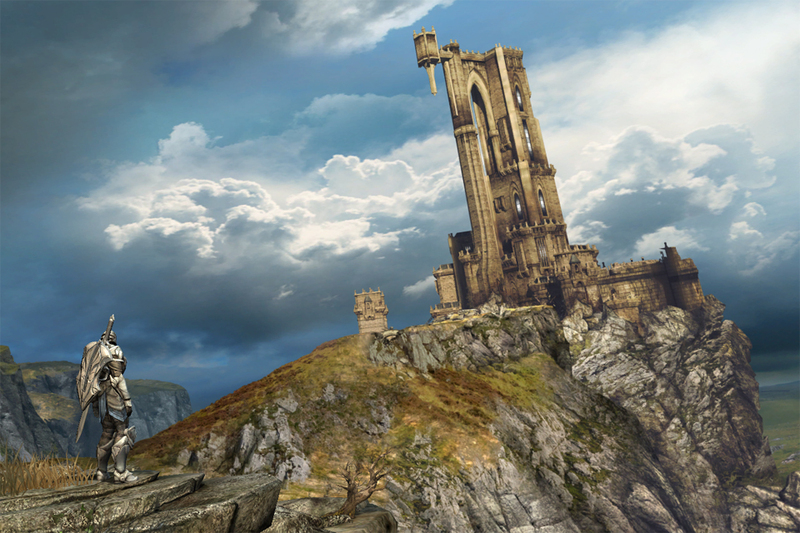 The game opens with a cut scene with your character ascending the castle to come face to face with the God King. In a cryptic foreign language decoded with subtitles, they chat back and forth for a bit before the God King dispatches his guard to fight you. This begins a brief tutorial which ultimately ends in the God King slamming his Infinity Blade straight through your gut, draining your essence, and powering up the God King even further. This begins the infinite loop that is Infinity Blade, as 20 years later, your successor stands staring the very same castle in the face. Navigating the castle is all done via a point and click interface, where you tap pulsating circles, watch a brief cinematic animation, and wind up where you tapped. At each stop you can look around, but you can never move anywhere but to the next waypoint. When an enemy appears, you can inspect them with a button in the bottom right corner of the screen, or tap them to fight them, which is when the real fun begins. 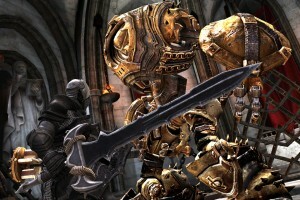 Infinity Blade is a game of technique more than anything else. Looking at the combat at its most basic level, you’re able to swing your sword by swiping, block by tapping the block button in the bottom center of the screen, or dodge either direction by tapping the bottom right or left sides of the screen. Sure, you can randomly block, dodge, and swing wildly, but doing well really involves putting all these moves together to avoid taking any damage while dishing as much out as you can. My favorite part of the combat system is parrying. When fighting enemies, you’re able to parry attacks by swinging your sword in the direction to collide with the incoming strike. It’s not that simple though, as different enemies all have different attack speeds, as well as different attacks which might be faster or slower. An immense amount of timing is required to successfully parry, especially as you progress in the game. 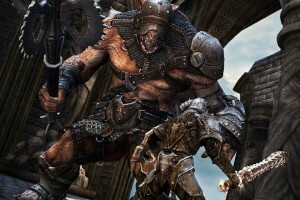 For instance, you might be fighting an enemy who is winding up a slow but extremely powerful attack. If you swing your sword too soon, you’ll just scratch the enemy. Too late, and you’ll have already taken it to the face. Dodging works much the same way. The truly neat part of all this is just how well the animation of your character translates to each swipe on the screen. If you swipe right, your character swings right, swipe left, and he swings left, and so on. What you begin to realize once you get farther in to the game is just how exact and deliberate each swipe needs to be. There isn’t any way to cancel your current swing once you swipe on the screen, so swiping in the wrong direction or at the wrong time can leave you open for attack for the entire duration of the swing animation. It all works incredibly well, and is just ridiculously cool once you begin to grasp these kind of nuances. Once you successfully progress through the castle, which will likely only take you around a half hour of solid play, you’ll be face to face with the God King again. It seems like with perfect technique, beating the God King might be possible on your first play through, but it seems far outside my ability. Inevitably, you will die, which just like the beginning of the game leads to your essence being sucked out. Thankfully, the God King is a good sport, and seemingly allows your next of kin to retrieve your corpse, all your gear, and any experience you’ve accumulated. After that, the next bloodline begins, with the successor of the previous victim of the God King overlooking the castle ready to try again. Why the God King keeps giving your loot to your predecessor and why your family doesn’t just decide that killing God Kings just isn’t for them isn’t ever explained. If you don’t kill the God King, you can send generation after generation of your bloodline to their death. Maybe I’m too much of a pacifist, but if I had heard that my great grandpa, my grandpa, and my Dad were all killed by the same God King, I’d explore a career in something other than revenge, but I digress. The way the equipment, experience, and magic system works in Infinity Blade is awesome. You earn experience through items, and as you fight, items are filled with experience until they’re mastered. For example, you buy a new sword from the in-game store with your gold coins that looks really cool. That sword has its own experience bar, and it gains a bit of experience after each battle. Any experience it earns, you also earn, and your character also has his own experience bar for leveling up. Once you fight enough with that sword to fill its experience bar, you master it. Mastered items provide an additional bonus, with the drawback that you can no longer gain experience through that item. This requires you to balance your equipment load-out based on several factors. Obviously, experience is required to level up your character. Using all mastered items, or more than a few, flat-out stops or greatly reduces the amount of experience you’re able to earn. If you’ve got a difficult battle coming up, you could equip all your mastered items to be more effective, but you’d be sacrificing all the experience you’d earn from the fight. Additionally, items have elemental properties to them for casting magic spells such as a fire spell, a lightning spell, and more. These are executed by tapping an icon when it’s ready in the top right corner of the screen, then drawing the spell’s gesture on the screen. The equipment system adds a really great element of replay value to the game. While the looping nature of the game is a little silly, the RPG-loving experience bar filling side of me absolutely loves how you’re constantly cycling new gear, leveling that gear up, and equipping something new. With each play through as your strength increases, so do the enemies you’re fighting, and the rewards you’re given. 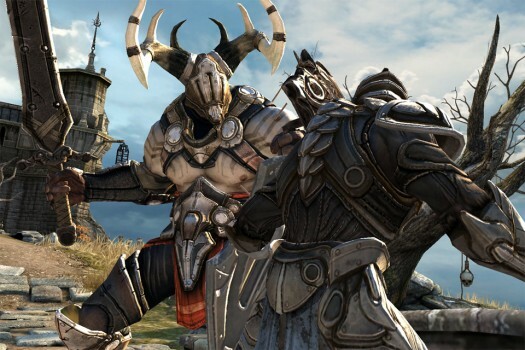 If you were expecting Infinity Blade to be some massive open-world RPG and any number of other things I’ve seen people on our forums suggesting, you’re going to be sorely disappointed. If all you were looking for is a fighting game with a really cool input method that fits perfectly with iOS devices, you’re going to be in for a treat. The RPG elements are very light, but the fighting is solid, and the graphics are the best we’ve seen so far on the App Store. Infinity Blade is universal, and seems to play equally well on both the small screen of the iPhone and the big screen of the iPad. I cannot stress enough just how great the graphics in this game are. 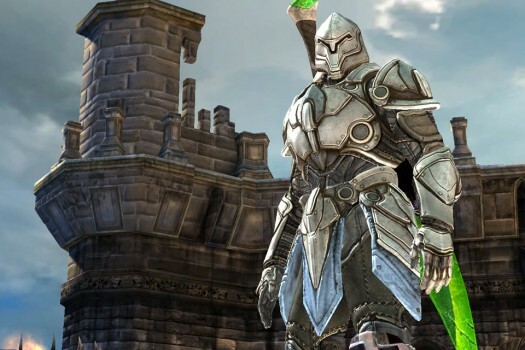 The bar has been raised, and anyone with a device capable of running the game needs to download Infinity Blade to see what the iOS platform is capable of.